Blue team have to try and pass the ball to team mates and maintain possession without the Red team touching the ball. Two Grids with 4v4 + 1 or 3v3 +1 directional to end zones. Team must receive pass inside the end zone or dribble into the end zone for goal to count. Team looks to penetrate to opposite side by using the neutral player. Player 1 passes to player 2, player 2 dribbles towards open space and splits the pass to player 3. Please 3 must focus on his/her timing to find gaps behind defenders. players follow their pass. 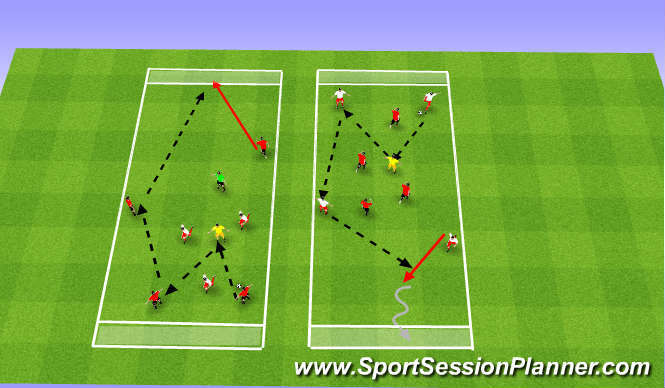 Add a combination between players B and C to look for the penetrating pass. Organization: Two teams of 6-3 defenders against 3 attackers in each half of the field. One neutral player. playing area is 45x30m with a 5m central channel as shown. A team scores by dribbling the ball across the end line. Play begins with coach. 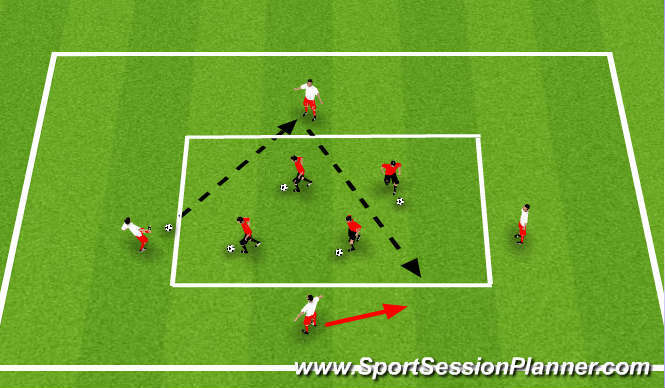 1) Coach serves a ball into the blue defender who, along with the neutral player, must try to make three consecutive passes before passing to the neutral player as he moves into the central channel. Once there he cannot be challenged and can compose himself before playing into the blue forwards and helping them to score by running the ball over the line. The ball must be under control in order for the goal to count. The members of the other team must try and prevent the blue from scoring and, if possible, win the ball and build the play in a similar fashion and attempt to score themselves. Play continues until a goal is scored or the ball goes out of play at which time the coach serves a ball into the opposing team&apos;s defenders and play resumes. The neutral player may roam anywhere but in order to move the ball from defenders into the forwards of a team she must receive a pass as she enters the middle channel. This is an opportunity for the neutral player to regain control and composure before beginning to attack the opposing defence. If the defending team should win possession then the play continues in the opposite direction. The neutral player is always on the team in possession. 2. Emphasis: Be composed and efficient. Receive the ball facing the goal whenever possible. Create passing triangles with your teammates. - Find space and try to face the goal as you receive the ball. 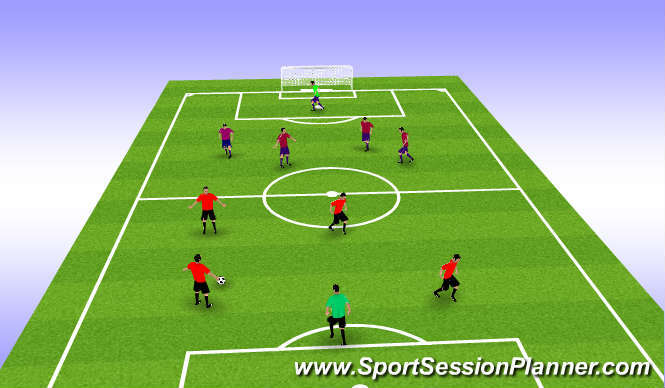 - Create passing triangles with your teammates. - Pass the ball and move into a new position. 4 v 4 small sided game.